Word Sketch Difference is an extension of Sketch Engine’s hallmark feature. 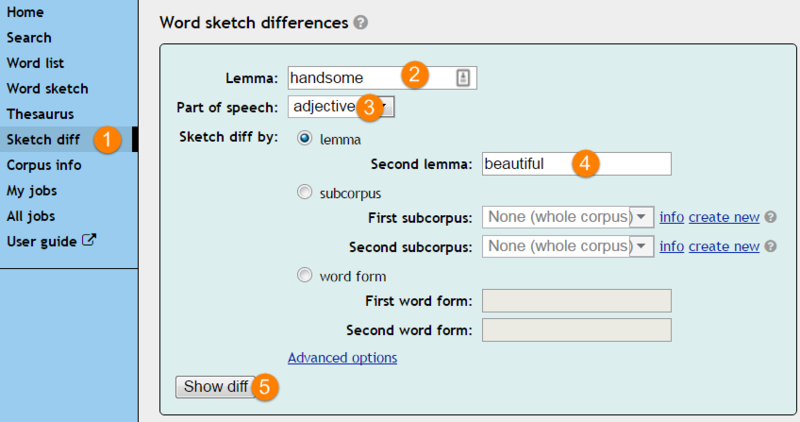 It generates Word Sketches for two words and compares them making it a breeze to observe differences in use. The feature is especially useful for close synonyms and also antonyms. The availability of this feature depends on the corpus. Click (1) Sketch diff in the left menu , (2) type the first lemma, (3) select the part of speech, (4) type the second lemma and (5) and click Show diff. The result assigns red and green colours to each lemma. The collocates in red tend to combine with the red lemma, the collocates in green tend to combine with the green lemma. The white collocates combine with both lemmas. Bolder shades indicate stronger collocations. To learn more about word sketch difference, please refer to the User manual.